Identify the devices on which you need to configure option ROM and/or I/O space allocation. See How to Determine Whether You Need to Allocate Option ROM and I/O Space. F2 if you’re connected through a Java console. Control-E if you’re connected through a serial console. The BIOS setup menu appears. Use the arrow and tab keys to navigate through the BIOS setup utility. Use the Enter key to make selections. When you are done, press F10, or navigate to the Exit menu screen to exit and save your changes. The Advanced Chipset Settings screen appears. 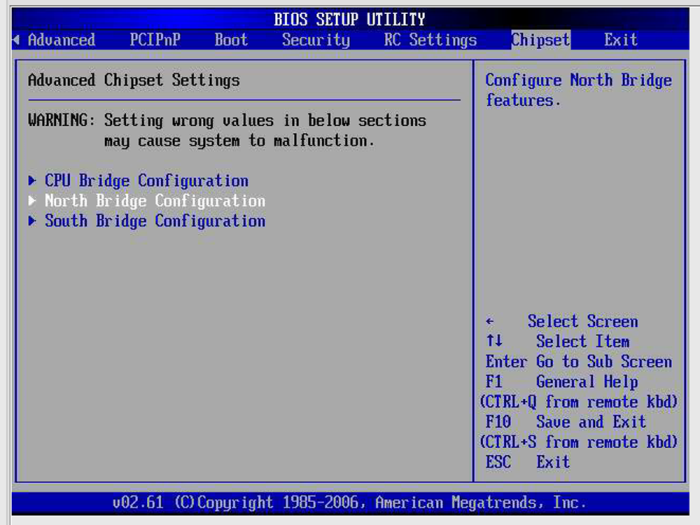 The NorthBridge Chipset Configuration screen appears. 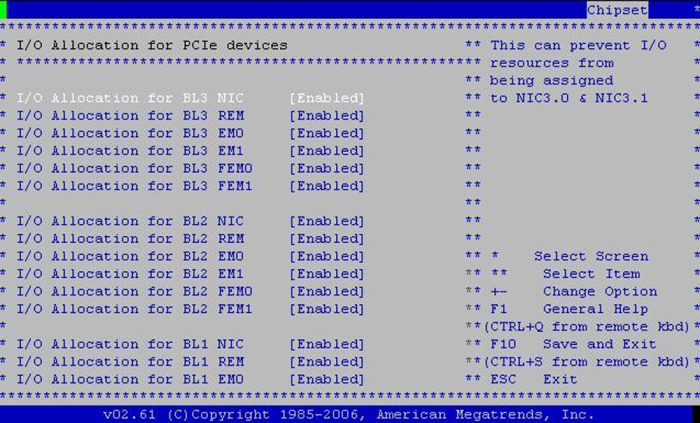 Select Option ROM Scan for PCIe Devices. The Option ROM Scan appears. Use the arrow keys to scroll down the list. Use the Enter key to toggle your selections. 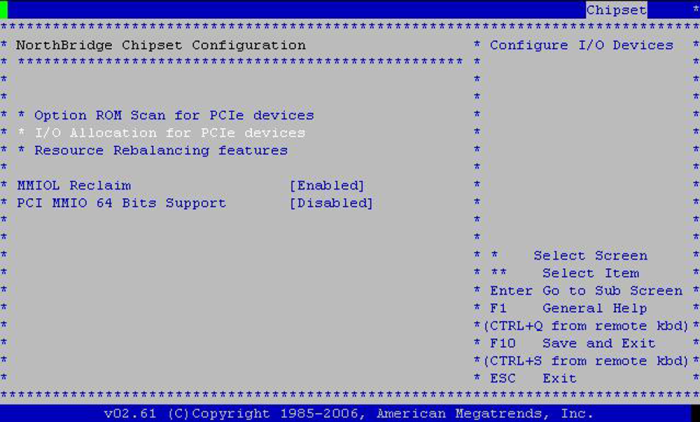 Select ESC to return to the North Bridge screen (to configure I/O space allocation), or select F10 to save your changes. Select I/O Allocation for PCIe Devices. 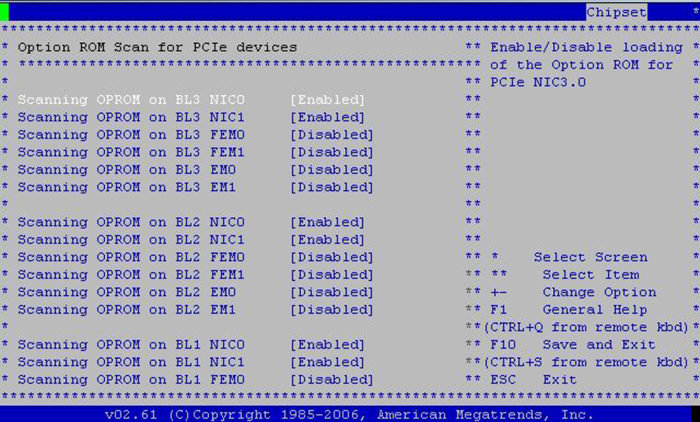 BIOS displays the I/O Allocation for all PCIe devices. Use this display to enable or disable devices as required. Enable any device you wish to boot from, and disable any device you do not wish to boot from. Note - This display includes all possible devices, including those that are not present. When you have made your selections, select F10 to save your changes and exit. The BIOS reallocates I/O space the next time the server boots.